If you want to make significant returns on your investments, then chasing after hyped up stocks without a margin of safety is something you should avoid as much as possible. In case you’re wondering, a margin of safety is a process that involves the selection of stocks or bonds that are presently selling for much lower than what your calculations suggest a fair trading price may be. The concept of a margin of safety was popularized by Benjamin Graham’s last chapter in The Intelligent Investor, in which he described a margin of safety as “the secret of sound investment.” In other words, having a margin of safety protects you against some of the inherent risks to investing by focusing your strategy on stocks and bonds with proven potential to perform, based on historical indicators. By taking an active role in your dividend portfolio’s management, you can diversify your investments and fine-tune the allocation of your funds to ensure you’re prioritizing stocks and bonds that are trading well below their fair values. In other words, you’re not concerned with stocks that are only slightly below their fair value or even stocks that are on an upward rollercoaster at the moment because you want to create a buffer in which some stocks could go south over time but for the most part, your investments are safe in the long-run. For instance, if you invest in 30 companies’ stocks that are trading 15-20% below their fair values, then it shouldn’t be a major cause for concern if a couple of those stocks never rise above the price you originally paid because: 1) You’ve diversified enough to shield your portfolio from a couple bad apples, and 2) You’ve created a margin of safety by investing in undervalued stocks with plenty of potential, which can lead to long-term, overall gains. The reason why you don’t want to cut it too close when it comes to your margin of safety – by investing in stocks that are only 4-8% below their fair values, for instance – is because this weakens your safeguards against uncontrollable market factors that could hinder your gains on a long enough time frame. It’s like height and weight limits on amusement park rides: the roller coasters are designed to handle much more weight than the posted maximum limits and your 1-inch-too-short kid would probably be fine on the ride in spite of the posted height minimums, but the park operators want to limit their liability as much as possible when it comes to possible incidents so some park guests may be excluded from certain attractions. In a nutshell: a margin of safety is created to minimize any chances of significant problems occurring. To calculate the stock’s fair value, it’s important not to confuse this with its market value. Thus, in order to determine your desired stocks’ fair values, you should start with Discounted Cash Flow Analysis (DCFA), which analyzes the value of a stock for any business that produces cash flows. For dividend-paying stocks in particular, you would use the Dividend Discount Model (DDM). You can accomplish this by first subtracting the dividend growth rate from the discount rate, then taking the dividend per share value and dividing it by the total you came up with in the first equation. It’s not an exact science, but this allows you to guesstimate the expected value of a company’s future cash flows. Once you calculate the stock’s fair value, you can then compare it to what price it’s currently trading at in order to assess whether or not it would contribute to your margin of safety (generally 12%+ lower than its fair value). 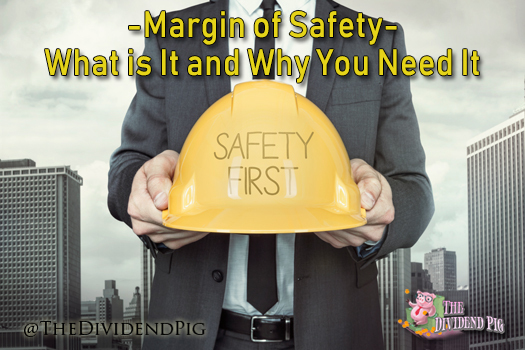 Do You Really Need a Margin of Safety? Given the recent volatility of the markets and rumors about a downturn on the horizon, it’s time for investors to buckle down with strategies that emphasize sustainable income through dividends and long-term stability with the help of a margin of safety. Without one, you could be at risk for considerable losses in your portfolio’s value, not to mention the potential opportunity costs of purchasing highly-valued stocks when they’re close or at their peak prices. There’s always some level of risk when it comes to investing, but establishing a margin of safety by consistently diversifying your portfolio and choosing undervalued stocks with favorable potential to grow in the future is undoubtedly a sound investment strategy. Nice post DP, and this is an area that I am definitely working on improving my ability. I’ve been trying to get better at utilizing the DDM to determine a fair value as it is quite important to have that margin of safety. If you’re looking for a follow-on post idea, it would be interesting to see how you break down that analysis and determine the value using the DDM on a real example. The part that I keep getting hung up on is determining appropriate estimates for the future growth, and in part I believe I am just over-thinking it.